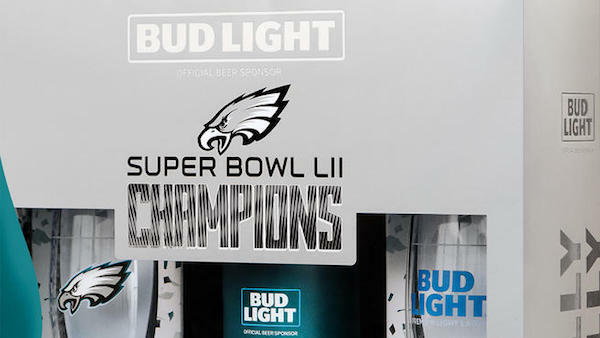 Bud Light looks to honor the Eagles. Earlier this week Bud Light revealed its limited edition “Philly Special”-themed Super Bowl LII commemorative pack that will hit stores Aug. 16, when the Eagles head to Foxboro for a preseason rematch with the Patriots. According to a press release, there are only 20,418 packs available — and that was done on purpose. The Eagles beat the Patriots in Super Bowl LII on Feb. 4, 2018, or 2/4/18. Each pack will cost $29.99 and will include a 25 oz. Bud Light aluminum bottle and two glasses with the “Philly Special” play on it. A select number of packs will allow fans a chance to receive tickets for the Eagles’ season-opener Sept. 6 against Atlanta. Check out Eagles offensive tackle Lane Johnson and teammate Brandon Brooks unboxing their very own commemorative pack on Twitter HERE. Print article This entry was posted by Art Eddy III on August 3, 2018 at 12:30 pm, and is filed under Sports. Follow any responses to this post through RSS 2.0. Both comments and pings are currently closed.